Engineering Innovation is excited to announce our newly awarded patent for our revolutionary Dynamic Sort mail sorting process. First introduced in 2007, this technology dynamically sorts flats to large numbers of destinations in a single pass. This enhanced Automation mail sorting process significantly reduces the time and cost associated with sorting and processing flats. Engineering Innovation introduced Dynamic Sort at the National Postal Forum in the spring of 2007. This innovative process revolutionized the mail sorting industry by creating an automated First Class mail preparation technique which finalizes the mailing in parallel with running a single pass on their EZ Flats system. 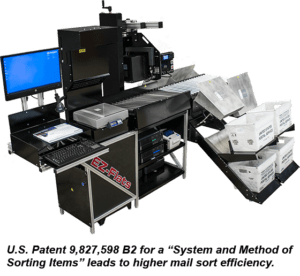 This MLOCR-based EZ Flats solution produces a bundle-based automated First Class mailing at a fraction of the cost of traditional flats sorting machines. EZ Flats users achieve impressive discount levels for automated First Class mailers of all sizes. By eliminating additional passes through the automated sorting system, overall handling is reduced and throughput is increased significantly. EZ Flats Dynamic Sort features automated pockets, an automated label applicator, and a patented software-based, sorting methodology for the most cost-efficient processing of First Class flats. Dynamic Sort identifies the tenth piece for bundle-based processing as it is read by the OCR, and then dynamically reassigns the routing designation for the maximum discount. This greatly reduces the amount of time required to bundle and containerize the mailing at the end of the run. 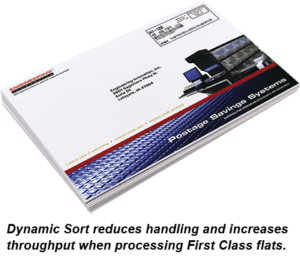 In addition, Dynamic Sort provides a road map for correctly packaging the mail to meet USPS requirements. To learn more about how Engineering Innovation’s EZ-Flats Systems can earn you the maximum discounts on First Class flats, give us a call at 800.350.6450 ext. 4110, or send us an email at sales@eii-online.com. Please view our EZ-Flats video by going to https://youtu.be/S8cMadsqX_M.